The 2018 Honda CR-V is a dynamic crossover on the road. Though it offers drivers a compact stance on the road, and is able to easily maneuver through tight or narrow city streets and spaces, you’ll find a spacious interior with plenty of room to accommodate both passengers and cargo. U.S. News and World Report notes that the high-quality, high-tech cabin offers “some of the most spacious passenger and cargo room in its class.” And with versatile seating configurations, lots of storage options, and available accessories that accommodate even more cargo, the CR-V is ready for any adventure. 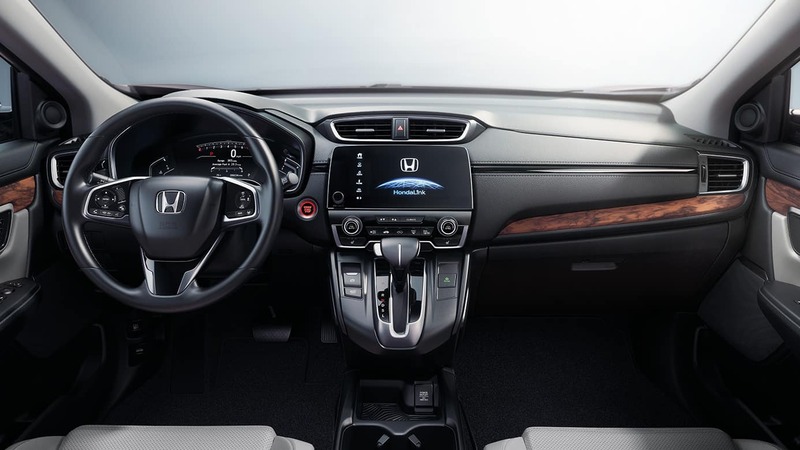 By offering drivers several different storage options, the cabin of the CR-V can easily stay organized and tidy. When every item has its tucked-away place, it frees up more space inside and eliminates clutter. Driver’s Side Garment Hook – Hang dry-cleaning or other garments on a convenient hook. It’s located behind the driver’s seat so it won’t obstruct the driver’s view. Front Passenger’s Seatback Pocket – Keep and store smaller items within arm’s reach with deep seatback pockets. 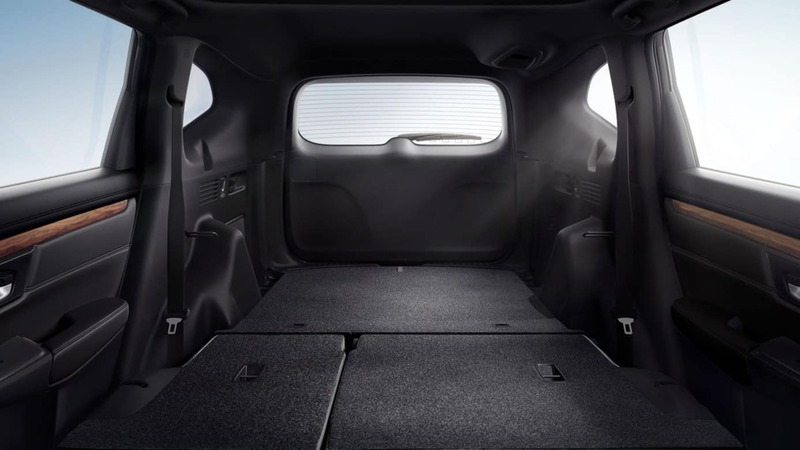 Door Pocket Storage Bins – The doors of the CR-V offer even more places for storage. Lockable Glove Compartment – Keep valuable items or other objects you want to keep safely out of sight inside a lockable glove compartment. Beverage Holders – With beverage holders in the front and rear rows, every passenger will have a place to put their drinks. Sunglasses Holder – Store your sunglasses where you can easily reach them when you need them most. Multi-Functional Center Console Storage with Sliding Armrest – With different compartments and storage shapes, drivers can store electronics, charges, even loose change—everything you need while staying organized. 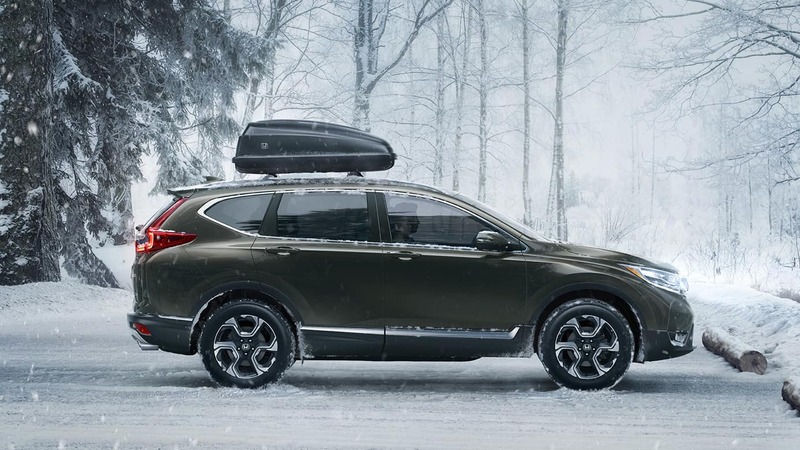 With class-leading space inside, the CR-V doesn’t serve cargo space at the expense of passenger space. Passengers sitting in any row will have plenty of head, leg, and hip room to feel comfortable in, even for long journeys. The available exterior accessories on the CR-V include attachments to the roof rails that free up more space inside. Attach large or awkwardly shaped cargo—from kayaks to surfboards—and take on adventures with the CR-V by your side. 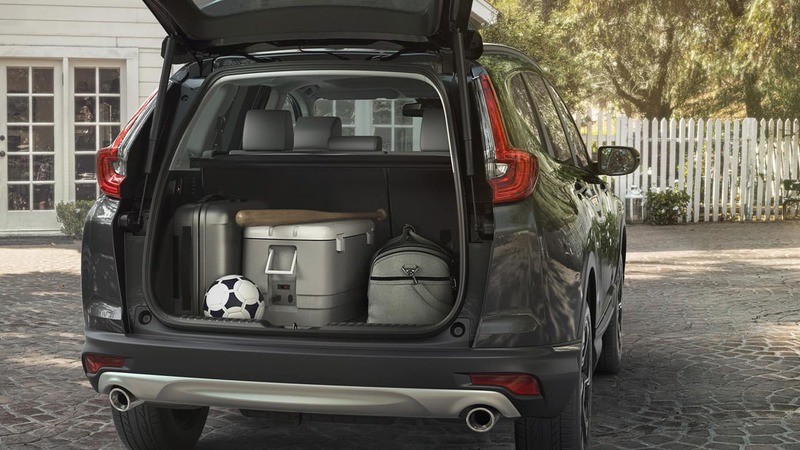 The CR-V has available interior accessories that help keep the cargo area tidy and organized. It also makes any cleanup process much easier. Liner – A cargo liner protects the cargo area and carpets from dirt, debris, or other elements that we can track in. Net – Nestle items such as groceries or other things you don’t want to tip over or shift during turns or stops in this handy cargo net. Organizer – A cargo organizer is a great way to keep similar or smaller items together, to find what you need when you need it and eliminate unnecessary messes and clutter. Tray – A cargo tray protects the original carpets and contains mud, snow, water, or dirt from wet boots, sandals, bathing suits, or other gear. Find out more information on the cargo space of the 2018 Honda CR-V by contacting us or visiting your nearest Central Illinois Honda Dealer. Explore current offersand sit behind the wheel for a test drive today.